Dipsacaceae, or the teasel family contains 350 species of herbs and shrubs in Europe, Africa and Asia. Some of these have already reached other continents. The Fuller’s Teasel (Wilde Karde), Dipsacus fullonum, is common here, as in the UK, and is an attractive plant – but do not let it go to seed near your garden! 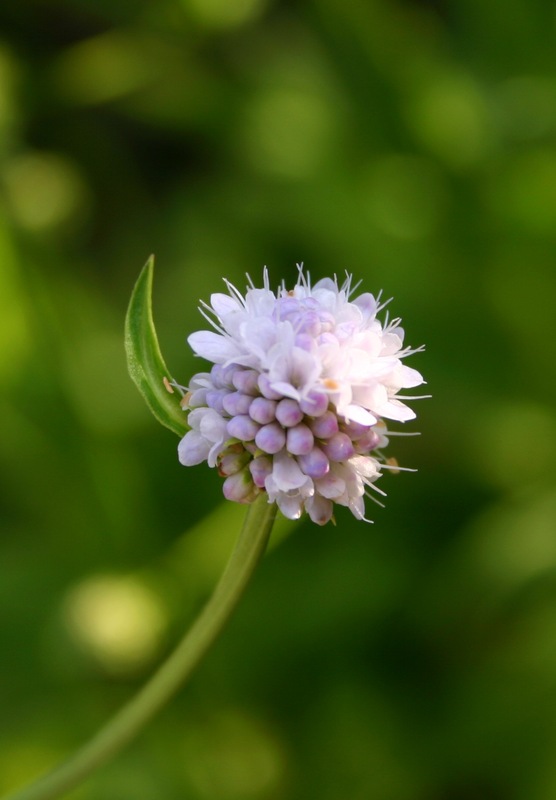 The Scabious (Skabiosa) is also in the teasel family, as well as the similar Knautia. They can be pretty invasive too. But I also have another member of this family in my garden – the relatively unknown (here, at least!) Succisella inflexa (Moorabbiss), almost the same as Succisa inflexa. The buds are slightly pink, the flowers icy white, with just a tinge of violet to them. The common name for the Succisa plants is Devil’s Bit, since the tubers appear to have a bite in them! 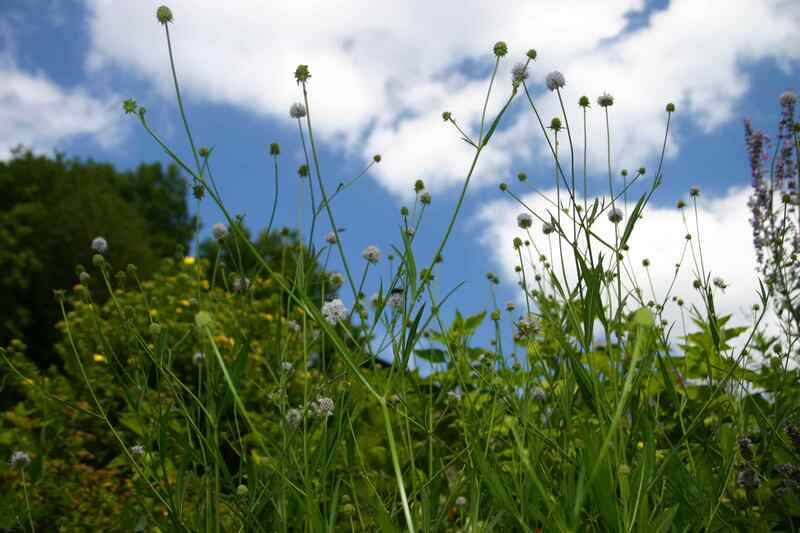 They are supposedly happiest on damp ground or wet meadows… well, I have three beautiful, healthy plants thriving on dry, well-drained soil in the full sun! However, I should point out that mine is a cultivated specimen: Succisella inflexa “Frosted Pearls”, which differs from the wild ones in that it is a little shorter (about 2ft high), and has longer leaves. It attracts bees and butterflies. It overwinters with no problem whatsoever. It tolerates heat and drought. It needs no attention and is not tempting to snails and slugs. Have you ever seen this plant before? I’d love to hear if you have! This entry was posted in Garden, Nature, Plants and tagged Autumn, Garden, Nature, Plants, Postaday, Summer. Bookmark the permalink. I too like your photos, but never heard of Succisella inflexa. It is pretty. 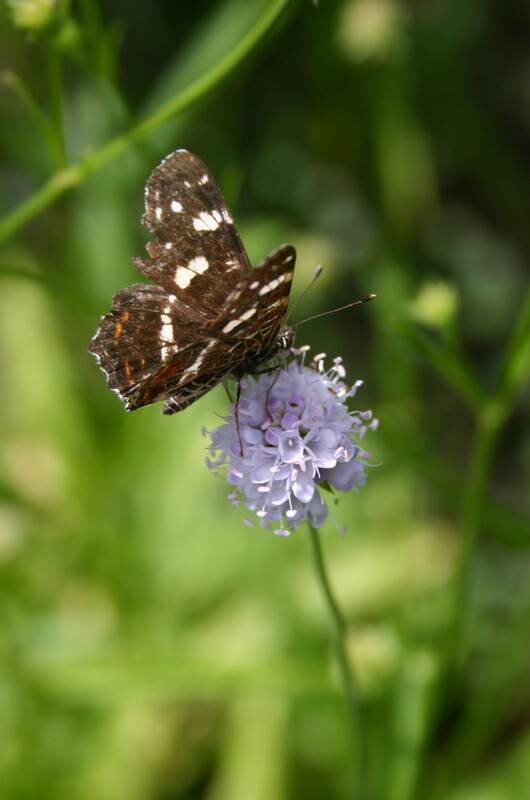 I do have Scabious in my garden any you are so right on it attracting pollinators. THANKS Eunice! And congrats to you too! Wow, two awards on one day! Thank you very much, and congratulations to you too Melody! Butterfly with the ground-colour orange? Have a nice weekend in your garden, Cathy! 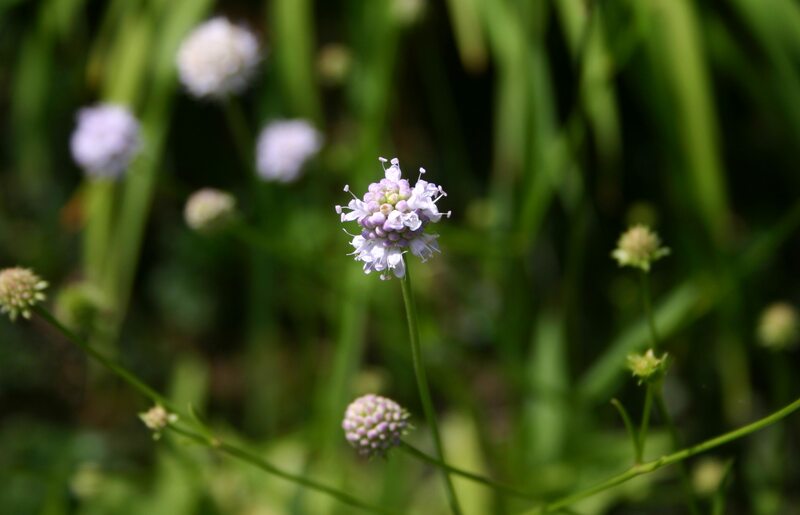 Cathy, I`m glad you will let me have some baby cream scabious. Thanks beforehand! Yes, it is VERY prickly! I put on two pairs of gardening gloves to cut some! It’s hanging up to dry and will be used for decoration in the autumn. A world away and I do the same! 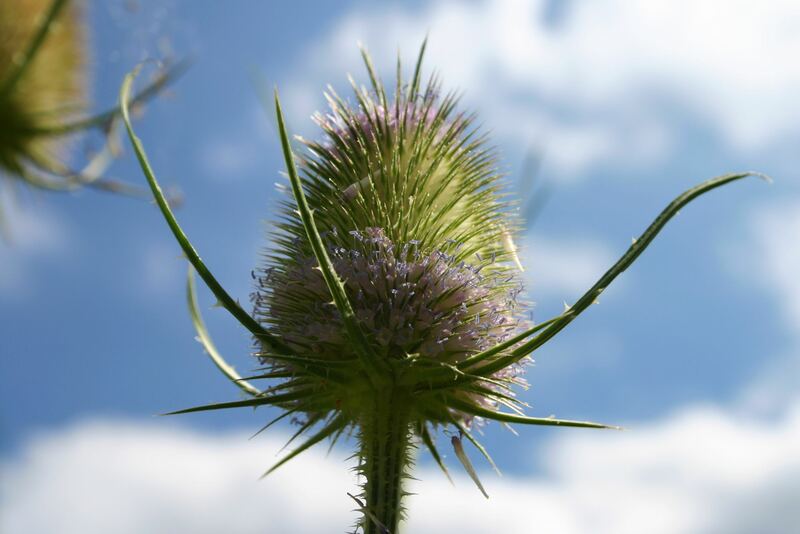 European settlers brought Fuller’s Teasel to this country and it has run rampant in fields and roadsides! I’d love to let mine go to seed (there were three in my garden this year) as the birds love them… but they are so hard to get out the ground once set! Teasel, that is name I have been trying to think of. Thank you! What a lot of nice plants you posted this time. We don’t have that butterfly, the name is just delightful. Your garden is lovely. Hi there. This was one of the quietest butterflies so far… sitting still for me to photograph it! Your photos keep getting better. The Summer Map butterfly has a ragged wing but I guess it doesn’t hinder him. Thank you Mountainmae! Yes, he seemed calm but perfectly happy. Love these flowers and your photos are so compelling. Great post. Thanks! I think I need some more of them they’re so pretty! Well Cathy you know I have had my battle with teasel as it is highly invasive and the knautia seeds itself all over, but I love this one..very pretty. 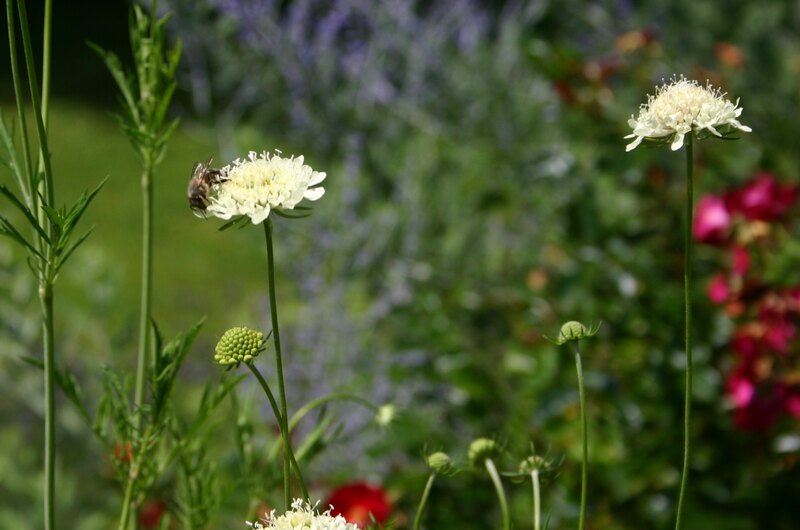 I think I’ve seen scabiosa offered for butterfly planting collections. I have so little space it’s not a plant I’d be able to give space to though… although this year we’ve had very wet weather and if a bird drops a seed here it would probably take off like Charlie! I don’t think I need the teasle… have enough prickly stuff here to pull out. 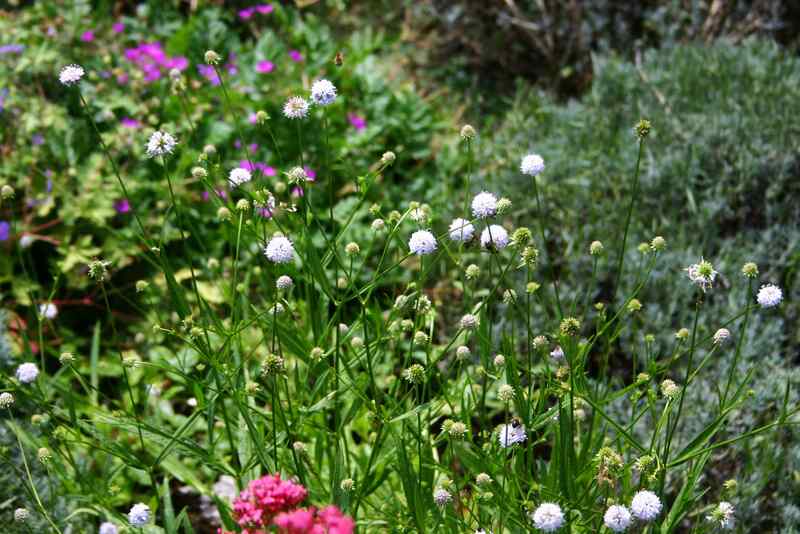 This one needs very little space, so it’s an alternative to the scabious.